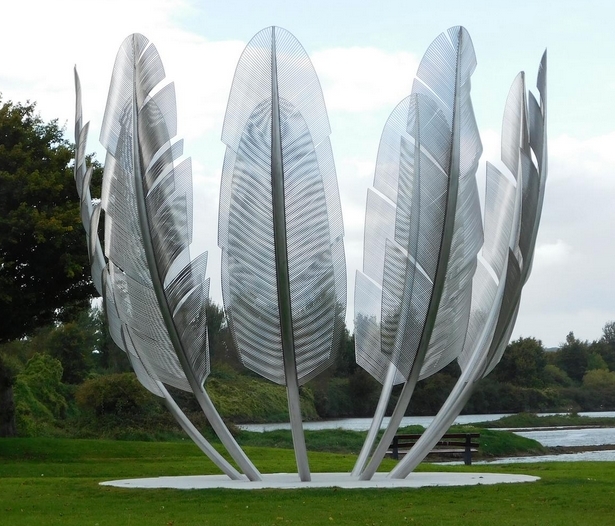 A sculpture of nine eagle feathers commemorates the time in 1847, during the Great Hunger, when the Native American Choctaw People donated a substantial amount of money to the Irish famine relief. 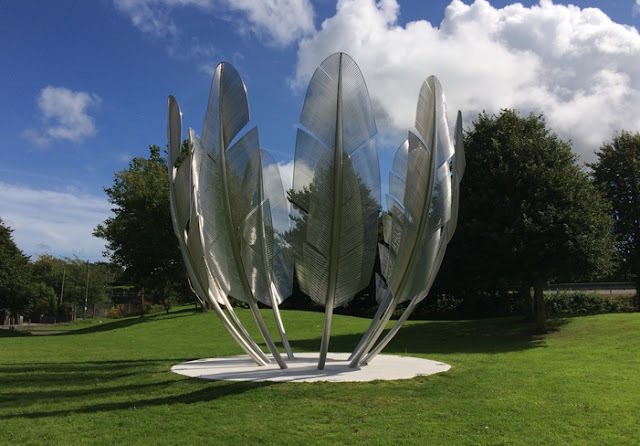 In 2015, a statue was commissioned to be built in Midleton, County Cork, Ireland, to honor the kindness of the Choctaws. But the story begins in 1831, when the Choctaw people were forcibly removed from their ancestral lands in Mississippi. A few years later, Choctaws learned of people starving in Ireland. Only sixteen years had passed since the Choctaws had faced hunger and death on the first Trail of Tears and a great empathy was felt when they heard such a similar tale coming from across the ocean. Individual Choctaws collected and donated $170 in 1847 to assist the Irish people. Jump ahead a century and a half. It took a year for artist Alex Pentek to create Kindred Spirits. With its nine eagle feathers reaching 20 feet into the air, the statue represents “this great moment of compassion, strength, and unity,” said Pentek. The official unveiling is expected to take place later this spring. For the month of March we would like to share with you a story from a Choctaw Nation employee. Shannon Compton recently visited Midleton, County Cork, Ireland, and expressed her thoughts and feelings when she saw the statue. 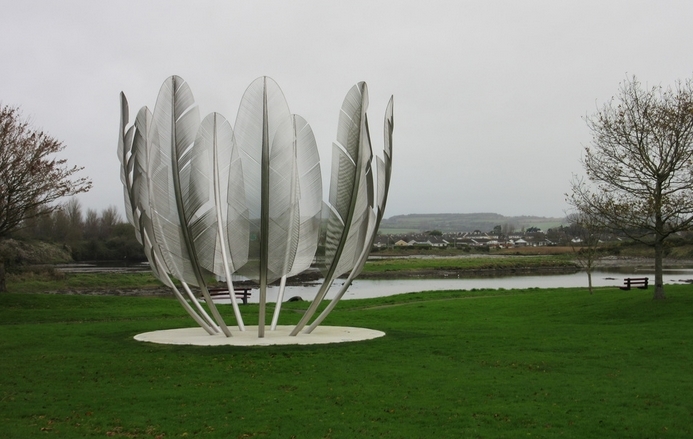 This is not the first time that the Choctaw nation has been honored in Ireland. In 1990, Choctaw leaders traveled to County Mayo to take part in a reenactment of the desperate walk undertaken by locals to their landlord in 1848. The gesture was returned in 1992, when Irish commemoration leaders took part in a 500 mile trek from Oklahoma to Mississippi. Former Irish President Mary Robinson has also been named an honorary Choctaw chief. A plaque acknowledging the contribution of the Choctaw people to the one million Irish people starving during Black ‘47 , the worst year of the famine, is mounted in Dublin’s Mansion House and reads, "Their humanity calls us to remember the millions of human beings throughout our world today who die of hunger and hunger-related illness in a world of plenty." Responses to "Irish town built a memorial to thank Native Americans who helped during Famine"
What an incredibly beautiful memorial. I did not know this history and am humbled by the generosity and heart of the Choctaw nation and of the Irish. Beautiful! I hope there will be more compassion show in this world. What a wonderful heartwarming story. We are all truly one human family. As the son of Irish immigrants to England, I also grew up feeling "other". I stretch out my hand to my Choctaw brothers and sisters across the ocean. This is so magnificent and says so very much for those people of these two groups. May they always be Blessed in their footsteps. I was ignorant of this story, but find it so compassionate, and thrilled that Ireland paid this wonderful tribute to the Choctaw nation. It is so hauntingly beautiful it takes my heart away. We are all one family, descendants of Noah, his wife, 3 sons (Shem, Ham, and Japheth) and their 3 wives after the flood (Genesis 6). Absolutely awesome display of love and gratitude across the great pond!! Will plan to visit in July's visit to County Cork ! that is wonderful. my people, the natives of north america are so long forgotten by many, yet we exist still! what a wonderful act so long after, goodness comes with rewards, no matter how long after. gorgeous sculpture! A lovely sculpture and an even lovelier sentiment. I love our Native Americans and all they stand for. I love the Irish, my heritage, and the beauty of the land and it's people. Two very authentic cultures coming together is so peaceful and encouraging in this world we live in today. I appreciate the sculptor's sensitivity to the lightness and fineness of the expression of the sculpture. Just beautiful!! Very fitting tribute.....That being said,the word "famine"does not apply! The very definition of "famine" is a scarcity of food; Ireland at that time had an ABUNDANCE of food. The potato crop was the ONLY failure. The were vegetables of all sorts: carrots, cabbages, parsnips, beets, spinach, et cetera. The were sheep, cattle, chickens, pigs,and dairy cows. Being an ISLAND there was more than enough fish and other seafood. The fishing boats were stocked with not only seafood, but animals, vegetables, fruits, et cetera, and delivered to ENGLAND! Plain and SIMPLE; IT WAS GENOCIDE!! Beautifull!! I was not aware of this. How can this be thought to the rest of the would. God blessed! A group of Choctaws collected $710 and sent it to the starving people in Ireland, a truly an amazing gesture considering that it was just sixteen years after the ‘Trail of Tears’. The Choctaw’s could well relate to hunger. Beautiful! Love the story, the statue, and the humanity. I am in awe and stand humbled by the resilience of the Choctaw and the Irish but of all people who have stood up to the diversity this world has been plagued by. These stories of unity and love are what we need now more than ever as the tiny minority that wishes to stir up hatred and division has a leader in the White House. We are all one race. We are all from the same source. Our common needs will bring us together now more than ever to create a new world that is based on cooperation and love for humanity. $170 in 1847 is equivalent to around $5,200 in 2019. Thats a lot of money considering where it came from. Cornmeal was $0.03 a pound in 1847 Ireland, so thats around 5,666 LBS of cornmeal or 59,768 meals at 1/2 cup servings. Back in those days with all the corruption against Natives. It's amazing the Choctaw actually got that money to the Irish. It puts a glow in my heart to see such kindness. Would love to find small replica of that sculpture to set on the mantel of our fireplace. Absolutely stunning from every angle, human and sculpture. Wonderful story. Fabulous sculpture! Who was the artist??? As a sculptor myself, it takes me to the fair that the creators of works like this, universally loved and admired, are seldom credited even though their talents are rare. Please, I'd love to acknowledge the artist. This is not surprising to me. The poorest folk have more generosity of spirit than any people of money, for the most part. The 'potato famine' was unfortunate, but what killed it was the Brits taking away other food,all of it. There has long been a policy of eliminating aboriginal peoples, and Ireland was targeted. Guess the Choctaw could relate?